Many mistakes that occur in scholarly endeavors are understandable. The truth is often difficult to discover, and this makes errors inevitable and expected. And of course, some mistakes are so insignificant that to complain of them would be mere pedantry. But this is not true of all errors. Some are both obvious and of such significance to their topics that they are egregious. There is reason to be concerned that this is occurring to some degree on the topic of prophets and the Lord’s revelations to them. Erroneous claims and arguments are not difficult to find, including some published under the auspices of reputable and mainstream entities. 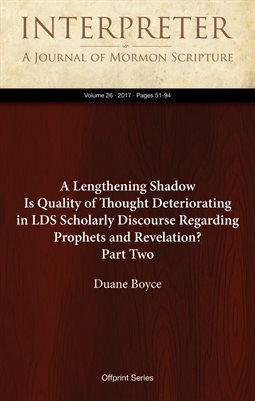 Is it possible that such errors are becoming common, and commonly accepted, in LDS scholarly discourse? Part One considered multiple examples, primarily from Terryl Givens and Patrick Mason, that begin to suggest a positive answer to this question. This installment, Part Two, considers examples from Grant Hardy that also suggest an affirmative answer.